This morning I woke up to find that my cat Roxy had stolen my dirty socks and was trying to bury them in her litter box. She could have been doing that because my socks were befouling her nasal passages but Roxy is known for stealing things and taking them to strange places. Case in point, she has stolen many things from around the house, from action figures to stuffed animals, a Soren Kierkegaard finger puppet, and feminine hygiene products. My wife once discovered that Roxy had left the toilet brush on her side of the bed. Waking up to the sound of my socks slowly being buried in kitty litter should be strange. It was certainly unexpected, but unfortunately, at least around my house, it wasn’t really all that strange of an occurrence. For those of you that know me personally, you know how bizarre my everyday life is. No matter what I do, or how innocently I try to do something, almost inevitably, something strange or weird happens. Those occurrences have become so common place with me that my family and friends call them “Shaneisms”, as in “that could only happen to Shane”. And these things happen so often to me that when it came time for me to think up a blog title, I couldn’t come up with a more fitting name! 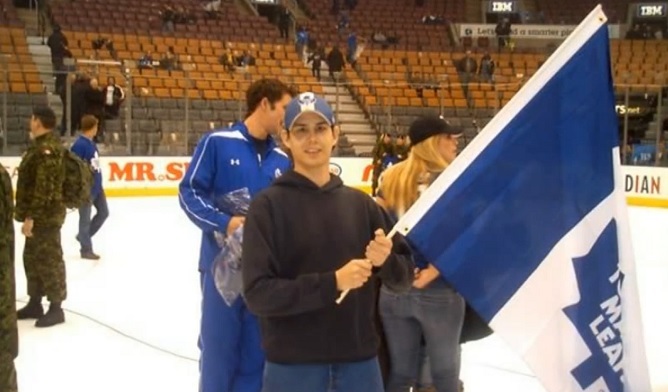 I was in Toronto and finished up my business early so I decided to go down to the Air Canada Centre to see if there where any tickets for that night’s Toronto Maple Leafs game. As I was in line for tickets, a man in full military fatigues asked “Are there any single people here?” and I said “I am”. He asked if I needed a ticket and I said “Sure. How much?” “It’s free. It’s Armed Forces night tonight and we have an extra ticket. It’s yours if you want it, courtesy of the Canadian Armed Forces“. I gleefully and gratefully accepted and thought to myself “hey, this is great… now I might actually have money left over for those overpriced hotdogs they have here”. I discovered that the ticket wasn’t for a seat, but rather was for a private box the Armed Forces were given for the night. As the night went on, not only did I end up in the box with members of the Armed Forces, but during the second intermission, the Commander in Chief of the Canadian Armed Forces at the time, General Walter Natynczyk, came to the box to meet and greet those in attendance, myself included. After the game was over, which the Leafs lost (I’m used to that by now…), all Armed Forces personnel and “their guests” were invited to go down on the ice and meet the entire Leafs team. The final icing on the cake is a very strange and weird coincidence: the person singing the anthem that night was Alan Frew, lead singer of 80’s rock band Glass Tiger. It so happens that my sister went out with him a couple times way back when. While the above is one of the most surreal Shaneisms, it’s not even remotely the only one. For example, I was working on a small film shoot in Toronto during Pride Week. We had finished shooting and were moving to our next location. While the rest of the crew moved equipment, I stayed behind and finished cleaning up. When I was done I started to make my way to the new location, only to find all the streets in the area blocked for the Dyke March. After surveying the situation, I decided the best way to get to my destination was the parade route, so off I went. As I walked I was getting many strange looks from parade onlookers. It finally dawned on me that I was the only guy I could see walking along the route and that I was surrounded by literally thousands of lesbians. I thought to myself “Meh, why not?” and eventually made my way to the new filming location. When I met up with the rest of the crew, they very quickly realized I had just come from the Dyke March, which led to many of them trying to hold back the giggles as we all got down to work. Or at least tried to. Some of the Shaneisms are my own fault. I do have a love of the absurd and a sense of humor that has been described as “off the wall” and “strange”. Case in point, when I was in the hospital battling kidney stones, I had to fill out a sheet of personal information. Part of that information was what title I prefer to be called (Mr, Mrs, Miss, etc) and I chose “other” and wrote in “Your Holiness”. Showing a great sense of humor, the hospital staff referred to me as “Your Holiness”, asking “Do you need anything, Your Holiness”, “How are you feeling today, Your Holiness” and on like so. This lead to some laughs for the other patients (and their families) in the same ward as me as some of them would peek out their doorways as I walked by. They wanted to see this person the nursing staff kept telling “it’s good to see you up and about, Your Holiness”. Not all the Shaneisms that are my own fault are done with on purpose. Having Attention Deficit Hyperactivty Disorder (ADHD) does tend to make me a little “spaced out” at times. I tend to zone out into my own little world and not notice things around me. This happened recently while I was availing myself of the washroom of my local library. When I tell people about my adventures, I often get a reaction of “you’re making this up”, or “pics or it didn’t happen”. I totally understand why people have that reaction. If I had to sum up my life in one sentence, it’d be a quote by Robin from the 60’s Batman TV show: “The way we get into these scrapes and get out of them, it’s almost as though someone was dreaming up these situations, guiding our destiny”. For a long while my father-in-law didn’t believe the strange stories constantly being told me and my wife. That all changed when we were coming home from a trip to a car dealership. We were driving down one of the access routes that separate the Hamilton mountain area from the lower city, where I live. As we did, we had a bodybuilding dwarf, all covered in tattoos, long hair flowing behind him, go by us on his bicycle, giving us the middle finger as he did. We stared at him, somewhat disbelieving, as he sped away from us. Without saying anything else, my father-in-law turned to me, looked me right in the eye and said “All those stories… I believe you now”. I’ve been asked why these things keep happening to me, and I can only offer up two explanations. The first is that this is all learned behavior from my dad. I believe this is partly right. He is a very friendly fellow, who sometimes doesn’t have the social decorum he should. Case in point, when he tells people, including complete strangers, the story of his heart attack, it always ends with “And I never did my underwear back”, at which point my mom tries to pretend she doesn’t know him. There is something to the theory that the Shaneisms are learned behavior in that once we tried to get rid of a wasps nest under a tree but used way too much gasoline, prompting an explosion much larger than anticipated, and leading to my mom to come running out of the house wondering why she just saw a fireball outside her window. The second theory is that these things happen because I simply tend to notice more things than normal and jump at opportunities that present themselves, even if my actions follow no discernible, logical process. I can admit this most likely the case. Having ADHD causes me process everything going on around me, whether I want to or not. It also causes me problems with impulse control. This causes opportunities that either would or should fall by the wayside to suddenly appear to me and I have to go for them, even sometimes against my (somewhat) better judgement. Playwright George Bernard Shaw, in saying “everything happens to everybody sooner or later if there is time enough” was getting at the idea that the longer we live, inevitably, the more varied experiences we will either have happen to us, or will have the chance to happen. Those experiences, both good and bad, can sometimes only be known if we make the conscience choice to know them. At the end of the movie “Ever After“, the Brothers Grimm ask the Grand Dame about the fate of Cinderella, if she really did live happily ever after. The Grand Dame responds “while Cinderella and her prince did live happily ever after, the point, gentlemen, is that they lived“. That line expresses the idea that the journey is just as important as the destination, that life is about seizing opportunities and seeing where life takes you. The adventure I had at the Maple Leafs game started just out of me not wanting to go home to Hamilton yet and wondering if there were any cheap tickets available for that night’s game. I walked to the Air Canada Centre thinking “they’re probably sold out, and even if they’re not, Leafs tickets are always really expensive” but I went anyway. I’ve had friends ask me “why do you get to have all the fun”. I tell them “just go with it… it’ll be fun!” and there have been many times they’ve ended up having an adventure of their own. My wife has said many times “my life has gotten a lot more interesting since I met you”.